It’s not every day you see a small drone, 3-D printer, a tarped-off sleep tent filled with pillows, and a video game tournament inside Illinois State University’s Milner Library. Those were all part of the experience at Redbird Hacks, a 36-hour hacking marathon (or “hackathon”) that took over Milner Library’s third floor on April 1–3. Run by students with support from campus and business sponsors, the 2nd annual Redbird Hacks challenged around 100 students on 20 teams to build or program a new website or application—all in just 36 hours. One of the Redbird Hacks competitors uses his phone as a virtual reality device. It’s not just who can finish within 36 hours; it’s about who can finish something all their own. This year’s Redbird Hacks winner was a virtual reality game called Pirate’s Dragon Lair, in which the player uses Google Cardboard to dodge obstacles in a maze to reach a treasure. Redbird Hacks also showcased technology such as a drone and 3-D printer during the competition. Illinois State senior Huan Nguyen was one of four team members who created Pirate Dragon Lair. He helped program and debug the game—all while working on about five hours of sleep. The fun part, he said, is creating something that people will actually use. Nguyen also competed in the 2015 Redbird Hacks. That helped him land an internship with one of the event’s sponsors, Mirus Research. “I like Redbird Hacks because it takes place so close to home,” said Nguyen, a senior information systems major focused on web development in the School of Information Technology. The word “Hacks” in the name “Redbird Hacks” isn’t drawn from the type of cybersecurity break-ins popularized in the movies. Instead, “hacking” means finding creative ways to use technology to do something—maybe even something that technology wasn’t designed to do. 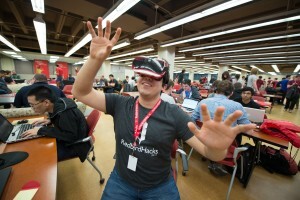 Redbird Hacks moved into its new home this year on the third floor of Milner Library. 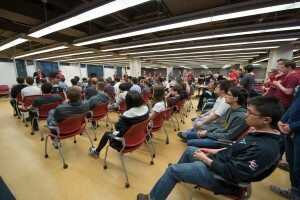 Redbird Hacks began at 7 p.m. Friday and ended at 9 a.m. Sunday, with teams working inside an open competition space lined with more than 3,000 feet of Ethernet cord. After Sunday’s judging, the two runners-up were a drone controlled by a brain-sensing headband, and an app that plays music based on what is drawn on a piece of paper. “We saw a lot of cool hacks,” Ringwood said. The 36-hour schedule was packed, including breaks for a video game tournament and an outdoor glow-in-the-dark game of ultimate Frisbee. The darkened sleep room—a big blue tent that student organizers pitched themselves—saw “full usage” a few times, Ringwood said. Ringwood has competed in other hackathons previously. Ringwood’s team was one of the winners at February’s Illinois Hacks competition at the University of Illinois. They turned a real Honda CRV into a “realistic controller” for the classic N64 video game Mario Kart 64. The steering wheel controlled the player’s direction, the real brakes controlled the virtual brakes, and so on. Yes, really. At Redbird Hacks, Ringwood said the student organizers took pride in being approachable and open with all participants. He also praised Milner Library’s staff for welcoming the event into its new home. Redbird Hacks is sponsored by several campus partners, including the School of Information Technology, and companies. Redbird Hacks sponsors included the School of Information Technology, George R. and Martha Means Center for Entrepreneurial Studies, College of Applied Science and Technology, and Katie School of Insurance and Financial Services. Business sponsors included State Farm, Mirus Research, Discover, Float Mobile Learning, Growmark, and ReMap Consulting.